A recent survey by hosted Microsoft Lync unified communications (UC) provider ConnectSolutions caught my attention and provided some interesting insight into the future of PBXs, desk phones and mobile devices. The survey results were posted on the company's blog, and while they dealt specifically with the percentage of desk phones used in Lync deployments, they seem to point to some much bigger changes in the overall voice market. The data presented was from May 2014 and they indicate that 78% of calls placed on the company's hosted Lync service used a Windows-based Lync client and another 3% used a Mac-based client. The big surprise was that a mere 18% of those Lync calls used a hardware desk phone. The mix of desk phones to soft clients point to the fact that as users move to UC solutions like Lync, it simply becomes more convenient and efficient to start making your calls through a PC. The other not-so-big surprise was the Lync mobile client. According to the survey, only 1% of the calls were placed using the mobile client. I had harbored some hope that Lync might offer the last hope for a meaningful mobile capability in UC where every other mobile UC solution had been an unmitigated failure. From this it appears that Microsoft is having no more success in delivering a mobile capability users want than the rest. Lync is coming at the voice requirement from a different angle, but users still prefer the native UC capabilities built into their smartphones than any of the kludgy mobile UC offerings. What really surprised me about the ConnectSolutions survey was the fact that the results were so dramatically different from that what we saw in the Information Week 2014 State of Unified Communications survey of 488 IT professionals conducted in April of this year. 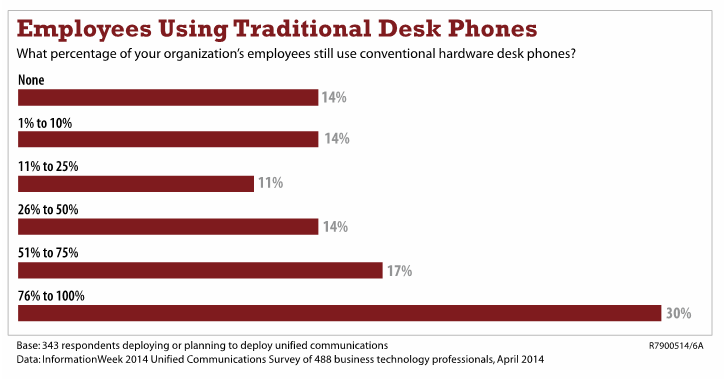 That study too saw a decrease in the use of desk phones, and some 14% of respondents who deployed UC had no desk phones while another 14% had 10% or fewer users with desk phones. And 30% reported having desk phones for 76% to 100% of users. The difference, it occurred to me, was that the ConnectSolutions survey targeted Lync users specifically while the Information Week survey looked at the PBX/UC market as a whole. Clearly there is more demand for desk phones in the total market, but they will be disappearing more rapidly in a Lync or other "pure UC" deployment. While those who are prone to hyperbole will assert that desk phones will disappear totally, that's not how markets work. I do believe that what we are seeing is a fundamental divide in the voice market between the traditional PBX customer and the nascent UC customer, and the soft phone experience is more appealing to the latter. That UC demographic is focused on knowledge workers who spend a significant part of their work day in front of a PC and for whom, the idea of making phone calls through Outlook or the Lync client is simply a more convenient way of getting things done. While UC can provide users with that new and more effective type of communications experience, that new experience isn't appropriate or attractive to all users. Even among their Lync users, ConnectSolutions found 81% of voice calls being made over soft phones, not 100%. Office 365 Lync users (like me) don't get PSTN access as yet, so I'm still looking up phone numbers in Outlook and then dialing them on my desk phone, but as soon as I can get PSTN access and port my office number to Lync, I'm there. I do not expect that all Lync users will warm to these new capabilities at the same rate - remember, there are still people using BlackBerries! Many users will recognize the convenience on day one, and others will follow in due course. What this means is that IT departments will need to allow for choice, and expect that nothing is ever going to be 100%. However, the ConnectSolutions survey is showing us is that the vast majority of UC users are taking the soft phone option. That Lync customer does not represent the entire population of voice users, and there are several voice scenarios that do not play to Lync's strengths. That demographic would include environments that call for a high percentage of basic analog lines. It would include non-contact center personnel who spend a lot of time on the phone (though greater adoption of communications capabilities integrated into other applications might change that), as would the health care and hospitality segments. Those customers will continue to buy traditional PBX solutions. The traditional PBX vendors focusing on those segments have been trying to expand the capabilities of their solutions by adding additional functionality either through higher end phones or, more typically, with tablets. I've sat through any number of vendor presentations describing wonderful new revenue-producing services hotels could offer using UC-like capabilities on in-room smart devices, but the reality is that most hotel guests are using their cell phones (with their integrated address books and other UC-like features) for just about all their calling needs. I do like the in-room tablets for things like opening the drapes, adjusting the thermostat or controlling the TV, but I really don't think that qualifies as "UC." If they could add room service ordering and wake-up calls to the tablet (some have), the hotels could probably forego in-room phones all together just like universities have done with dorm room phones. The other big revelation from the ConnectSolutions survey is that when users are mobile, they are using their cell phones just the way the manufacturers have designed them. In other words, the mobile UC clients, even the Microsoft variety, continue to be a total bust. Cisco Jabber, Avaya oneX, Unify OpenScape have long been a meaningless addition to UC. Lync is coming at the voice requirement from a different angle, but with only 1% of the voice calls using the Lync mobile client, it appears that Microsoft is having no more luck at migrating users from their native smartphone UC capabilities than any of the other traditional PBX vendors. 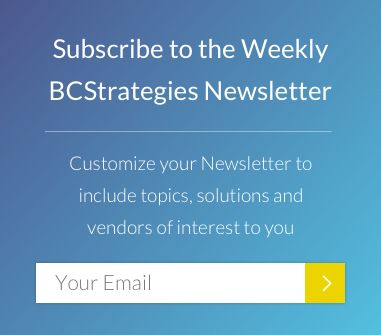 In the end it appears that the voice business is splitting into two distinct segments, one that essentially follows the traditional PBX market and one that takes a new trajectory defined by the capabilities provided in what we now call UC. Both will have a place in the world for the foreseeable future, but clearly, the growth in UC is coming at the expense of that traditional PBX market. And in the mobile space, neither group is having any luck besting the native smartphone experience.